Fresh from leading his team to a convincing semifinal win over defending champions India at the World Cup 2015, Australia captain Michael Clarke is set to retire from One-Day International (ODI) cricket after their Sunday’s title-clash against New Zealand. “Just so everyone is aware, tomorrow will be my last ODI game for Australia,” Clarke was quoted as saying by cricket.com.au. “It’s certainly been an honour and a privilege to represent my country,” he continued. Clarke, 33, has represented Australia in 244 ODIs, scoring 7907 runs at an average of 44.42 that includes 8 centuries and 57 half-centuries with the bat. A handy occasional left-arm orthodox bowler, Clarke also has 57 wickets to his name in the 50-over cricket. 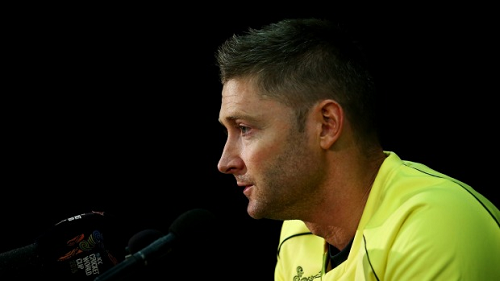 Clarke insists that the reason behind his retirement is that he doesn’t foresee himself in a good shape for the World Cup 2019. “I don’t think it’s reasonable to expect I’ll be fit and healthy and available for the next World Cup, so I believe it’s the right time,” he concluded.